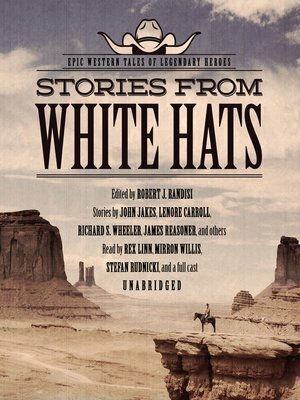 Buffalo Bill Cody, Bat Masterson, and other legendary heroic figures of America's Old West get the royal treatment in White Hats, a collection of stories by esteemed Western authors. This anthology is expertly compiled by Robert J. Randisi, who has gathered extraordinary stories of those who wear the white hat from well-known authors like John Jakes, Richard S. Wheeler, James Reasoner, and others.In this collection you will hear the following excellent stories: "The Winning of Poker Alice" by John Jakes, "Sojourn in Kansas" by Lenore Carroll, "The Diamond-Ring Fling" by Lori Van Pelt, "The Cotton Road" by L. J. Washburn, "Buffalo Bill's Last Dream" by Arthur Winfield Knight, "A Commercial Proposition" by Richard S. Wheeler, and "Day of Vengeance" by James Reasoner. Lenore Carroll is a novelist who lives in California.